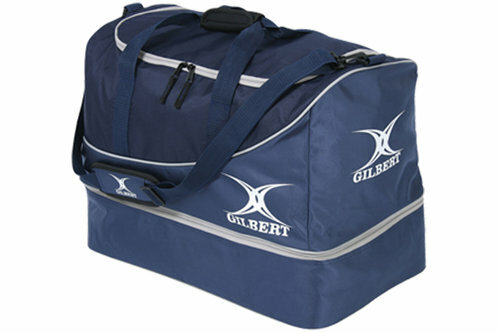 Rugby players come with a lot of baggage but that can all be safely stored away courtesy of Gilbert's Club Hardcase V2 Matchday Bag. The spacious main compartment is accessed via two zips which run atop the holdall. Inside and there is room to store your kit, footwear, equipment and any other essential items. The soft base of the holdall increases the storage options and is ideal for keeping items separate such as dirty clothing, boots or anything needing to be protected. A stylish, as well as practical, navy tone with grey edging is applied across the whole bag and sports the printed Gilbert logo along one side. For easy of carrying an adjustable shoulder strap is accompanied by two handles which can be joined together. This bag measures 55cm x 40cm x 40cm. Please note, due to the size and weight of this item we are unable to deliver outside the UK.